Arguably the best known and most widely respected mark of quality ever created was what is now called the ‘sterling’ lion. There is, however, a mystery surrounding its use since it has never been established what it was originally designed to represent. It may have been intended to indicate that Goldsmiths' Hall was now (1544) under the control of the king since the Goldsmiths' Company had been obliged to surrender its charter in that year, the year of its introduction, but there is no reference to it in the Company's records (see note 1). Legislation dealing with the marking of plate wrought in England, has always had to do with those marks which must be applied to a piece of plate which has been assayed as of the required standard. No law has ever been passed dictating that any mark must not be applied to such plate. It is a fact that any one of us is quite at liberty to punch whatever marks we choose on our plate so long as that plate, if of a legal standard, also carries the marks dictated by legislation. The Goldsmiths' Company took advantage of this fact for the first time in 1478 when they introduced a mark in an alphabetical sequence which was designed to identify the responsible wardens in a given year of their election. They took advantage of it again in 1544 when they introduced the lion passant guardant which, notwithstanding the above reference to the surrender of the Company's charter to the crown, is widely believed to have been intended to show that wrought plate was not being debased, as the coinage of the time was, and was thus a standard mark. In 1542 king Henry VIII began minting coin at less than sterling standard and by 1544 had debased it to such an extent that it contained only a fraction over 50% silver and the copper, with which the silver was alloyed, was beginning to show; he became known as 'old copper nose'! At this stage the Goldsmiths' Company must have felt that some way must be found to show that they had not similarly debased their plate as, according to statute, they were entitled to do and, although no reference is made in their records to this dilemma or to its solution, it is widely believed now that the method they chose was to introduce a new, lion passant guardant, mark to be struck on all plate assayed by them. As the statute of 1300 required that the fineness of plate should be as good as that of coin, the Goldsmiths' Company could, in 1544, have allowed plate of the same debased standard as coin. Indeed they were obliged to strike the mark of the Leopard’s head on their plate and this actually indicated that such plate was of at least coin standard. They chose, instead, to maintain the genuine sterling standard. A mark to indicate this genuine standard, and to, as it were, override the Leopard's head is altogether reasonable! Whatever the intention of the Goldsmiths' Company at the time, it has always been regarded as a standard mark and as the leopard's head, introduced by statute was the official standard mark ("......and that no manner of vessel of silver depart out of the hands of the workers until it be essayed by the Gardiens ( Wardens) of the craft, and further that it be marked with the Leopard's Head,........") (see note 2), it could be argued that this new mark was ambiguous since it had no statutory standing. However, as the Goldsmiths' Company continued to mark plate with the leopard's head they were at liberty to apply this extra mark unchallenged. Indeed it quickly gained acceptance as is shown in an indictment of 1597 brought against John Moore and Robert Thomas, for working and selling bad plate and for counterfeiting the marks applied to it, in which the Attorney General refers to it as "Her Majesty's Lion" (see note 3). The statute of 1300 was originally written in old Norman French, in which language the following directive is given: "E qe nul manere de vessele de argent ne parte hors des meins as overers tant qe ele soit assaie par les gardiens du mester e qu ele soit signee de une teste de Leopart". Octavius Morgan translated 'teste' as head and 'leo-part' as lion passant guardant (see note 4), the head of which would be outward facing and it is unlikely that this was a mistranslation since, in heraldry, the term leo implies a lion and it is also true that the early marks applied to English plate following this statute appear to depict the full face of a male lion. In 1614 Seldon stated that "In blazonry leopards and lions were synonymous and used indifferently" (see note 5) and Stephen Friar is even more specific in his book 'HERALDRY'. He states that "In early armory what is now a lion passant was described as a leopard and indeed any lion that was not rampant was blazoned leopardé" (see note 6). On page 84 of his book 'The Illustrated Book of Heraldry' Stephen Slater informs us that "In 1235 the German emperor Frederick II presented Henry III of England with three leopards as a living shield of arms" and goes on to pose the question "Was this a reflection of the English arms of the time?" From which the conclusion may be drawn that the three lions appearing on the English Royal coat of arms are English depictions of leopards since in French heraldry a creature that is passant guardant is always a leopard. Thus in England lions and leopards were synonymous! It could be argued therefore that the lion passant guardant, introduced in 1544, was just another form of the beast dictated by statute and did not deviate from this statute until, in 1821/2, the guardant was dropped. It is thus altogether possible that the Goldsmiths' Company believed that they were complying with the law when they introduced their new mark and did not consider it ambiguous in any way. In 1675 The Goldsmiths' Company themselves issued an order relating to the practice, which had then grown up, of 'untouched' plate being offered for sale, in which they refer to such plate as "not marked with the leopard's head crowned, as by law the same ought to be" but in spite of this reference to the law the same order states that all plate should be submitted to be "assayed at Goldsmiths' Hall, and there approved for standard, by striking thereon the Lyon (sic) and leopard's head crowned, or one of them...." (see note 7) so that, as, in this order, either would do, the Goldsmiths' Company obviously considered their, non statutory, mark as good as the statutory one at this date! (N.B. as by this date coin was again sterling, then the leopard and the lion both represented the same standard for silver whereas between 1544 and 1561 (see note 8), during which period coin debased to varying degrees remained in circulation, they had represented different standards). 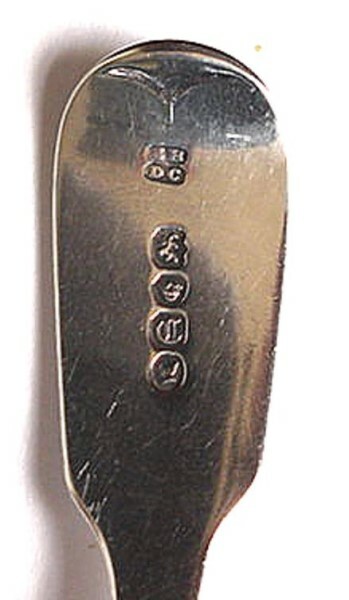 When, in 1697, the 'new sterling standard,' (see note 9) known since circa 1720 as the Britannia standard, was introduced the 'date' letter was given legal status for the first time as it was mentioned as a requirement for the marking of plate. The lion too, although dispensed with, gained legal acceptance by implication, since the figure of Britannia (see note 10), which replaced it, was also required to be stamped on plate of the new standard. As the lion's head erased replaced the leopard's head ("......instead of the Leopard's Head and the Lion, shall for this plate be the figure of a Lion's Head erased, and the figure of a woman commonly called Britannia......") (see note 11), it became the new official standard mark and the Goldsmiths' Company appears to have been happy to adopt this mark for the purpose for which it was intended. Thus items of plate of this period which carry only one mark applied at Goldsmiths Hall will be seen to carry the lion's head erased stamp. I know of only one exception to this and this is a knife haft which has been marked with the Britannia stamp as a single mark. I feel that this must have been a mistake and is thus very rare indeed if not unique. When the sterling standard was reintroduced by the Act of 1719, the lion passant guardant was mentioned for the first time as a legal requirement for the marking of plate, although no indication was given as to what it was to represent. The Goldsmiths' Company had, apparently, always looked on this mark as a standard mark, notwithstanding the legal status of the leopard's head mark, and so, now that it had legal status, they adopted it as their official mark. Items of plate made after 1720 (see note 12) and of sterling standard which carry only one mark applied at Goldsmiths Hall therefore are found to be stamped with the lion passant guardant rather than the leopard's head. The leopard's head had not lost its legal status as the official standard mark so that plate of this standard (sterling), of the early eighteenth century which is fully marked, wherever it was assayed (see note 13), should carry both the lion and the leopard marks. (Fig I). Notwithstanding the Goldsmiths' Company's attitude towards the lion passant guardant their appreciation of the importance of the leopard's head is shown by the working practice adopted in the assay office in the 18th century. The weighing, drawing (the taking of the sample to be assayed) and assaying was carried on in the morning and part of the duty of the Drawer was to strike the marks of the lion and the date letter on the plate from which he had taken the drawings. The Touch Warden, who was the final guarantor of the fineness of assayed plate, attended in the afternoon to strike the leopard's head mark on all the plate which had been assayed that morning. Thus the leopard's head mark was accepted as the final guarantee of fineness. The acts of 1700 and 1702 which conferred the right to assay plate on other towns (see note 13) specifically stated that as well as the maker's mark and the statutory fineness marks, each town must also strike its plate with a mark, comprising its city arms, to show where such plate had been assayed. This requirement had never been laid upon London so that it was in the anomalous position of having no identification mark of its own at this time. Thus plate assayed in London in the 18th and 19th centuries carries one fewer marks than that assayed in provincial towns! (Fig II). Fig. I: Hallmarks on a spoon assayed at Newcastle in 1854 showing the correct use at a provincial assay office of the leopard's head, the lion passant guardant and the city arms. Fully marked items assayed at provincial offices thus carry one more mark than those assayed at London but see the reference to Birmingham and Sheffield. A further unexplained mystery surrounding the leopard's head mark is that, when the assay offices at Birmingham and Sheffield were opened in 1773, it was still on the statute books as the legal sterling standard mark but was never adopted by either office. The act of 1719, which mentioned both the leopard and the lion, was not directed at the London Goldsmiths' Company but at the "mystery or craft of the goldsmiths" and thus applied to all the assay offices. The act of 1773, on the other hand, referred specifically to the offices of Birmingham and Sheffield and mentioned the lion but not the leopard! note 1: J.S.Forbes. HALLMARK A History of the London Assay Office. The Goldsmiths’ Company & Unicorn Press. 1999. p.63. note 3: Sir Charles Jackson-English Goldsmiths And Their Marks-Second Edition-Dover Publications, New York 1905. p.44. note 4: Jackson 1921 (reprinted 1964) edition p 51. (The findings of Octavius Morgan) NB; The 's' was not replaced by the circumflex until 1762 when the Académie Francais, founded by Cardinal Richelieu in 1635, rewrote the French dictionary. note 5: Oxford English Dictionary (compact edition) Oxford University Press 1971-p1604. note 6: Stephen Friar-HERALDRY-Sutton Publishing Limited-1992-p195. note 7: Jackson Op cit p.45. note 8: An indenture dated 5th October 1551 restored the fineness of newly minted silver coin, indeed between then and 1553 it was 1dwt. better than sterling. Coin already in issue however remained debased until 1561.
note 9: The first mention of the term 'Britannia standard' which I have so far come across appears in House of Commons Sessional Papers of 1720! note 10: The Duchess of Richmond, the King's mistress, sat for a portrait from which, it is believed, an engraving was made for use on the new copper coin introduced in 1672. This was called Britannia and a similar engraving was used for the new silver mark in 1697. N.B. An entry in Pepys' diary for 25th. Feb. 1666-7 reads: "The King's new medall, where, in little, there is Mrs. Stewart's face.....and pretty thing it is that he should choose her face to represent Britannia by". note 11: 8 Will III. C.8. note 12:But see the reference to The Goldsmiths' Order of 1675. After 1720 it seems that either would not do as they had in 1675 and only the lion was used! note 13: From 1701 assay offices at Bristol, Chester, Exeter, Norwich and York had operated and from 1702 one at Newcastle as well which, as it had been assaying plate since the early 17th century and on a regular basis since 1668, had continued to do so "to all intents as if the said town has been included" (1 Anne (stat. 1) c. 9) even before 1702.
note 14: A.B.L. Dove FSA-The Finial- (The Journal of The Silver Spoon Club of Great Britain) Jan/Feb 2005 p.15. This article is based on text first published under the title "The Enigma Of The Lion" in the November/December 2005 issue of 'The Finial'.